If you are on your feet all day, you know how that wears on your whole body. Your feet take the brunt of virtually every move you make when you walk, stand, bend, kneel, and other movements you make while on your feet. Even if you are not on your feet all day, several hours of sitting, standing, walking, and such at work takes its toll on your feet. Did you know there are more nerve endings per square inch in your feet than in any other area of your body? Therefore, the health of your feet has a major impact on your nervous system. Your feet are the foundation of your body and should be cared for like you would any foundation (house, cake, etc.). A good foot massage is just the ticket for relieving those aches and pains after a long, difficult day on your feet. Here are the best foot massagers, which I have handpicked from the top devices available on the market. MedMassager’s Speed Foot Massager features a full-sized oscillating foot pad with an arch bar designed to stimulate circulation in your feet and legs. Its ergonomic design and ideal angle help target pressure points on your feet, which provides the highest level of comfort throughout the massage. The MedMassager Speed Foot Massager is FDA certified for therapeutic and home use and features 11 speed settings that range from 1,000 to 3,700 rpm. The company offers a one-year full replacement warranty against defects. This device is suitable for people with diabetes and neuropathy as well as for those who suffer with severe leg, joint, muscle, and leg pain since it boosts blood circulation and eases the pain. The biggest complaint about the Speed Foot Massager is its operational noise, but most users don’t seem to be bothered by that as it doesn’t affect their relaxation. Brookstone is a popular top-tier and trusted brand, making this Shiatsu Foot Massager a favorite among its users. It features massage rollers and air compression that work to knead out muscle tension in your feet. The deep foot wells provide you with an immersive experience that embraces your whole foot, not just the soles of your feet, like most other foot massagers. You get a foot-surround massage with the choice of high or low intensity modes and three auto-massage selections, soothe, pulse, and energize, and selectable heat function to achieve full relaxation. This foot massager is designed to mimic the sensations and relaxation you would get from a foot rub after a long, hard day. The major complaint about this product is that it doesn’t get warm enough, but this tends to be a common issue across most foot massager user reviews. Overall, the Brookstone F4 Shiatsu Foot Massager is a high-quality, feature-packed, well-designed device. It even has a built-in power cord and an easy grab handle to make it easy to store and move around. You can remove the fabric linings of the foot wells to wash them. The Naipo foot massager features Shiatsu, deep kneading, rolling, tapping, air compression, heat, and more features for foot pain relief and improved circulation. The features of this technology allow you to control the settings that make you most comfortable on any given day. You may need more intensity or a different massage mode depending on your day. Because you are able to immerse your feet into the air pockets, your heel, instep, and feet experience a thorough massage. You get the benefits of foot massage while you enjoy the pampering experience. While this machine is a high-end foot massager, it comes with a two-year manufacturer warranty and ranks high with its users. A good rule of thumb for using this foot massager is to avoid using it for over 15 minutes and don’t use it before bed. The uComfy Shiatsu Foot Massager 2.0 is also a full-foot massager. It features Shiatsu-style massage as well as vibration-style massage to help relax muscle tension. You can choose heat if you need more than just a foot massage. If you prefer no heat, the air pressure that surrounds your feet inside the foot wells will provide ample foot comfort. The acupressure massage features provide you with the proper amount of heat and compression to help get into those pressure points that relieve tension in the muscle of the feet. Choose your level of intensity according to your foot massage needs on any given day so that you will experience the level of massage and relaxation you need. The reviews were somewhat mixed since the massager isn’t a lifetime device However, the overall functions and performance of the foot massager makes up for the limited lifespan. The uComfy Shiatsu Foot Massager 2.0 weighs 12 pounds, making it less portable than some others, but the durable, quality materials are capable of handling regular use. As with any Shiatsu foot massager, seek medical advice before using this technology. If you are seeking a foot massager that uses Shiatsu, kneading, rolling, and vibration massage and heat, the Giantex massager could be the one. This is a multipurpose calf and foot massager that relieves aches, pains, and tense muscles in these areas. Designed to mimic the ancient massage methods, the Giantex massager targets the appropriate areas of your feet, soles of your feet, and your calves. It provides a full 360-degree experience. You may choose from the custom modes that allow you to select from three variants of intensity and three heat levels to treat whatever your feet and calves have been through on any day. While customers give this device good reviews, some have claimed it doesn’t allow you to control the intensity and that the device needs to better target the most common pressure points. This machine shuts off automatically after 15 minutes, which the maximum you should be using it in a given session. This may prove frustrating to some, but the device can be turned on for another session if necessary. The Giantex foot and calf massager is categorized in the mid-point range of cost, making it a good investment unless you want to spend more to get higher quality. Having sore and painful feet affects your whole body. It is miserable to experience foot pain. One of the reasons foot massagers like this Belmint Shiatsu Foot Massager Machine are so popular is because people want relief from foot pain. Whether you experience diabetic neuropathy or foot pain from being on your feet all day, a good food massager that you can use at home is a welcome relief. The experience of a deep tissue foot massage has benefits like increased blood flow, which helps with foot pain. Deep-kneading massage is one of the features you get with this Belmint foot massager. People with plantar fasciitis, foot knots, muscle tension, and other chronic or acute foot pain issues can use this device for relief. Remember to always consult with your doctor before using this kind of technology. The heat function along with air compression and Shiatsu-style massage nodes provides you with five setting variations to help you find the perfect foot massage for you. 18 rotating massage nodes are used to provide relief from foot pain in the making of the Beurer Shiatsu Foot Massager. Besides Shiatsu massage, you also get heat when you want to use it. Beurer built in two massage speed levels so you can control the level of intensity for your relaxing foot massage. The rotation and targeting of the massage nodes target your reflex zone and relaxes tense foot muscles, boosting your circulation and offering relaxation. It is worthy of note that people with larger feet claimed this foot massager worked well for them and that the heat setting was superb, especially with other devices lacking in this area. If your goal is to have a portable, lightweight, and compact foot massager, the Beurer Shiatsu Foot Massager fits those traits. Water therapy is one of the most beneficial ways to relieve pain. Add that to heat and massage and you get a fully functional foot spa for those difficult days on your feet or days when you experience more pain than usual. High-frequency vibration, heat therapy, and oxygen bubbles massage are the three effective aspects of using this device. It is touted to improve blood circulation, relieve fatigue, improve metabolism, and calms the meridians (Qi). It is a foot bath for your tired, aching feet and a way to maintain good foot health. Three presets allow you to select your levels of heat, bubbles, and vibration. This technology provides you with ample relief of foot pain and aids in relaxation. The most complaints about this foot massager are related to the water not staying hot long enough, the length of time it takes for the water to drain from the machine, and the jets aren’t as powerful as some users like. However, with some Epson salts and/or bath oils, this machine will promote healthy feet and ample relaxation. Keep in mind that the vibration massage function isn’t going to provide Shiatsu or kneading massage. HoMedics is a popular name in health and wellness supplies such as massagers. The FMS-270H model foot massager provides deep kneading Shiatsu-style massage for deep tissue foot massage, resulting in relaxation and the reduction of tense foot muscles. 18 massage nodes and six rotational heads make up the design that relaxes your aching feet. You can also use toe-touch to control the settings without having to lean down and make the changes you want. Most user reviews claim this machine is very relaxing without intense sensations. The rollers are designed to massage the entire sole of your foot from heel to toe. Some reviews noted that the need to reposition your feet on the rollers helps get to those small painful spots. The heat and intensity are not strong enough for some users, but if your feet are sensitive or you prefer something less intense on your feet, this device is a good choice. Please notice that there is mention in the description that this is not recommended for diabetics. The lightweight, portable, and ease of use characteristics of the HoMedics FMS-270H are the most commonly mentioned. Always check with your doctor before using this kind of device and read the user reviews to get a full picture of what you are getting before you invest your money. Not everyone wants a deep tissue massage on their feet. Some people enjoy the vibrations of good foot massager like this one by Farnsworth & Lloyd. Using methods from reflexology and acupressure, LED red light therapy, raised nodes for reaching pressure points, and vibrational massage, this machine is designed to reduce and eliminate foot aches and pains. It is especially designed for soft tissue, nerves, chronic pain, and muscle tension relief. Standard and Boost are the two modes you have to choose from, which allow you to customize your foot massage. Standard mode features gentle vibrations, which are good for poor circulation and soothing your feet. It is suitable for foot pain related to diabetes, age, air travel, and desk work. Boost mode provides a more intense vibration to rejuvenate sore or tired feet. If you work on your feet all day, this is a suitable setting. Lack of power, noise, and low heat are three user review complaints that created mixed reviews for this foot massager. Here we have another Belmint foot massager that has a similar, but not the exact same, design as the Farnsworth & Lloyd. This particular design is intended for chronic foot pain, neuropathy, plantar fasciitis, tired and sore feet, and nerve pain. The Shiatsu massage nodes covered with a soft mesh material are designed to provide a gentle rolling motion that kneads your aching feet while targeting your acupressure points. It is effective for releasing tight muscles and relieving tension in your feet. The optional heat function allows you another way to relax your feet even further. While users like this machine, they had issues with the grinding noise (loud motor), the lack of speed control (one speed only) and having to move their feet around to maintain best results. This machine is not approved for diabetics, so be sure to do your homework before investing in a foot massager. This device is not an electric foot massager, but a manual, targeted handheld tool you can use to relieve soreness and painful feet. It provides dual therapy with ice (freeze it) and massage. The body design of this little manual foot massager is flexible and can target difficult to reach areas. You can use this on virtually every part of your body. The seven stainless steel spheres in three various sizes provide targeted relief you can take with you anywhere. This product is made in the USA and features a unique design that allows you to focus on getting rid of not only foot aches and pains, but scar tissue from every angle all over your body. For people who cannot seem to sit still for electric foot massagers, wearing these foot massage slippers is a good alternative. The rotating nodes are designed to active upon motion, which makes them ideal for working around the house. The design is based on reflexology to offer a deep massage for your feet. The manufacturer claims that it is normal to experience initial use discomfort, but that is how reflexology works. With proper use, over a few sessions, you will see the benefits. Since users seem to agree about the initial discomfort, it is wise to wear them only 10 minutes at a time and build on that time over days or weeks. The benefits of wearing these foot massage sandals include improved back pain, fewer cramps in your legs, improved circulation, and they may even help improve issues with headaches and arthritis. If you are a person who prefers something simple and more natural for your foot relief, the TheraFlow foot roller is a good alternative. This is designed to relieve foot and heel pain and is constructed from high-quality Theaceae wood, making it an affordable, simple alternative to electric foot massagers. Since you use your feet to control this roller, you have total control over how much or how little pressure you get from your massage. Due to this design, it is suitable for all foot sizes. This simple foot roller can relieve sore feet, plantar fasciitis, and neuropathy. It certainly improves circulation and blood flow. Instructions on how to use this natural, simple foot roller/massager help you learn the different ways to use it to your advantage. Users report less tingling and numbness in their feet from use and fewer issues with cold feet due to poor circulation. The large surface area makes this ideal for massage both feet simultaneously. Since not everyone has the time to go get a professional foot massage, the best alternative is a soothing foot massage in the comfort of your home via a quality foot massager device. You can find these devices at your local drug store, department store, health store, or other retail stores that sell health devices. Before budgeting for a foot massager, it is important to talk to your doctor or medical professional first, just in case there are health or medical issues that would prevent the use of this technology. These are some of the top benefits of foot massage. Your feet are your body’s foundation. When something is wrong with your feet, your body is affected. 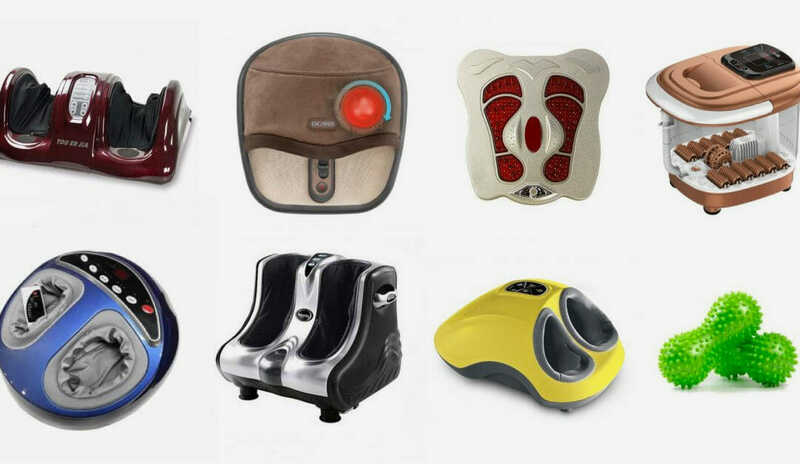 Keep this in mind when you are choosing a foot massager so you can choose the best one for your specific needs. We got our grandfather the Brookstone F4 Shiatsu Foot Massager for Christmas last year and it was probably one of the best presents we’ve ever got him. He was so pleased with it. The massager also has a heating function so it’s perfect for long cold Canadian winter evenings.